Celebrate the start of the season with the whole family at Fenway Park! 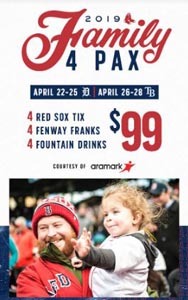 April 22-28 when the Red Sox face the Detroit Tigers and the Tampa Bay Rays, Family Pax are back. Tickets are $99* and feature 4 Red Sox Tickets, 4 Fenway Franks and 4 Fountain drinks. Purchase Tickets. Come watch the reigning World Series Champion Red Sox in action with the family over April School Vacation.